Editor's note: On August 21, 2017, Code42 announced that it is no longer offering CrashPlan for Home. The company now focuses on business customers. As an enthusiastic evangelist for backups, I recommend and use online backup services—not exclusively, but as a simple way of maintaining secondary backups offsite that would still be available even if my Mac and backup drives were stolen or damaged. Among the many providers of online backups, I personally prefer CrashPlan. In fact, I liked it enough to write a book about it several years ago. But increasingly, people have been asking me why I use CrashPlan—not in an “Oh, just wondering” way but in a “Seriously? You? Still?” way, as if it should be obvious to anyone that there are better choices out there. So I’d like to tell you why, and in the process offer comparisons to a few competing services: Backblaze, Carbonite, DollyDrive, and MozyHome. But let me preface my remarks by saying that having good backups is vastly more important than which app or provider you use. If you’re happy with a different provider, that’s terrific, and I’m not here to convince you to switch. The No. 1 worry I’ve heard about CrashPlan is that it is a Java app, an increasingly rare animal in 2015. Java (or, more specifically, the Java Runtime Environment, or JRE) has a long list of well-known security issues, enough that Apple stopped including it with OS X starting with 10.7 Lion. You can still download Java from Oracle yourself if you like, but Oracle has begun bundling adware with it, which makes it even more unappealing. Apart from security issues and ads, apps written in Java tend to have somewhat odd-looking, un-Mac-like user interface elements. 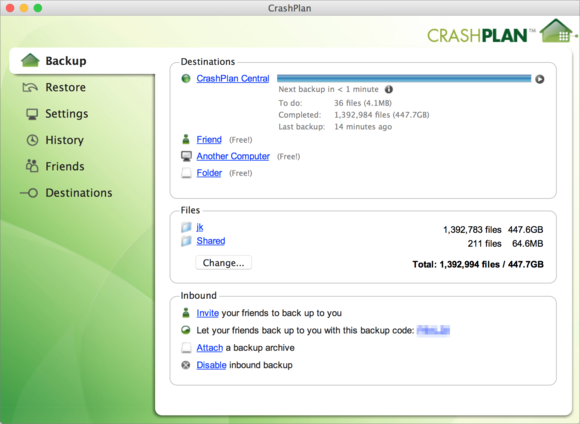 And indeed, the CrashPlan app looks more like a series of web pages than a Mac utility. CrashPlan developer Code 42 publicly stated a few years ago that a native Mac app was in the works, but for some reason it has so far failed to materialize. Instead—perhaps as an interim measure while the native app is being perfected—CrashPlan now bundles its own copy of Java. That means you can run CrashPlan on your Mac without having to download Oracle’s Java—it behaves just like a stand-alone app. More importantly, CrashPlan’s built-in version of Java is self-contained, inaccessible to other Java apps and to websites, which are where most Java security exploits originate. And it doesn’t include the adware. So although I could wish for a more modern, Mac-like look and feel, CrashPlan’s use of Java is a non-issue when it comes to security. With all those links and tabs, CrashPlan looks more like a Web page than a Mac app. 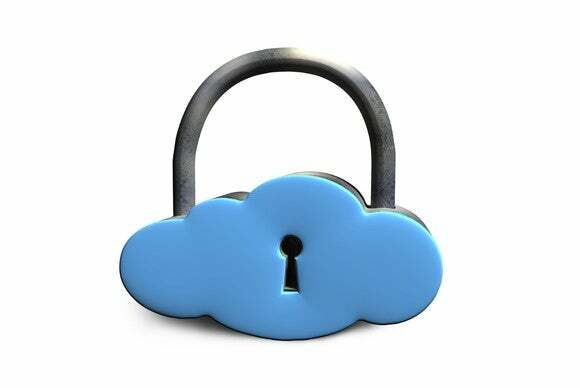 In terms of basic features, online backup services are more alike than different. All the services I looked at let you specify which files (or file types) to include or exclude, although they make different assuptions about which ones to select by default. None of them will let you restore your entire Mac (including OS X and apps) to a bootable state, so they avoid backing up those files in the first place and instead focus on user-created data such as the contents of your home folder (/Users/you). CrashPlan lets you use its app for local or peer-to-peer backups for free (with some restrictions, such as only one backup per day). Paying for online storage also gets you continuous backups, stronger encryption, mobile access, and a few other features. Pricing starts at $6 per month for unlimited backups from a single computer, or you can save buy paying for one year ($60), two years ($115), or four years ($190) at a time. CrashPlan’s Family Plan covers unlimited data for up to 10 computers, and it’s a better deal if you have three or more computers to back up. The Family Plan costs $14 monthly, $150 for one year, $290 for two years, or $430 for four years. Backblaze. I’ve heard nothing but positive comments about Backblaze. I’ve met the guys who run the company, and they’re great. The native Mac software is clear, reliable, and easy to use, and it worked well for me during the year or so I used it. So I’m reluctant to criticize it, but I do have a few bones to pick. While Backblaze is easy to use, a few of its quirks drove me away. First, file restoration drives me nuts. You log in to your account on the Backblaze website and select the file(s) you want to restore, and what you get back is a Zip file containing those files—in a replica of their original folder structure. So, if you restore a single file that was stored 10 levels deep in a series of nested folders, your expanded Zip file will be a series of 10 nested folders with your file inside the last one. After digging down to it, you’ll have to drag it manually to the corresponding spot on your disk. That’s a minor inconvenience for one file, but a huge hassle if you’re restoring lots of files from different locations. 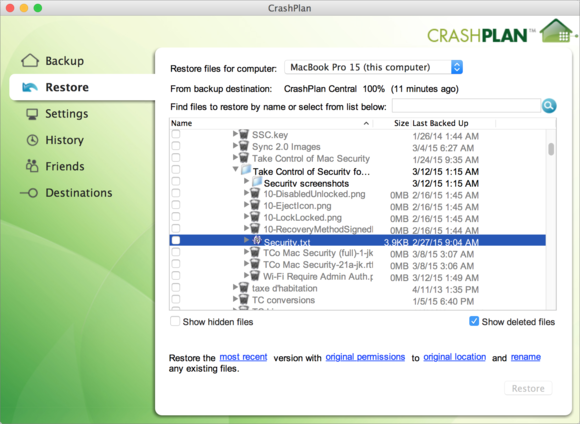 By contrast, the CrashPlan app gives you the option to restore any file to its original location—either overwriting or renaming any file of the same name. Which is exactly what I want, 90 percent of the time. 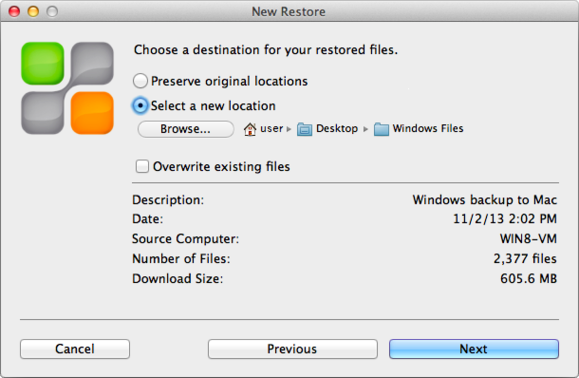 Or, if you prefer, you can restore files to your Desktop or any other arbitrary folder. CrashPlan gives you the flexibility to restore any version of a file to either the original location or another destination of your choice. My second issue involves pricing. Backblaze costs $5 per month (or $50 per year, or $95 for two years), per computer, for unlimited storage. That’s pretty good, and slightly lower than CrashPlan’s annual, single-user fee. But my family currently has three Macs that need online backups, so Backblaze would cost us $142.50 per year. With CrashPlan’s Family Plan, paid for four years at a time, my total family cost works out to just $108 per year. If I were backing up 10 computers, CrashPlan would save me $1,470 over four years compared to Backblaze. Finally, and least significantly, Backblaze lets you back up external drives, but the only destination is the cloud. 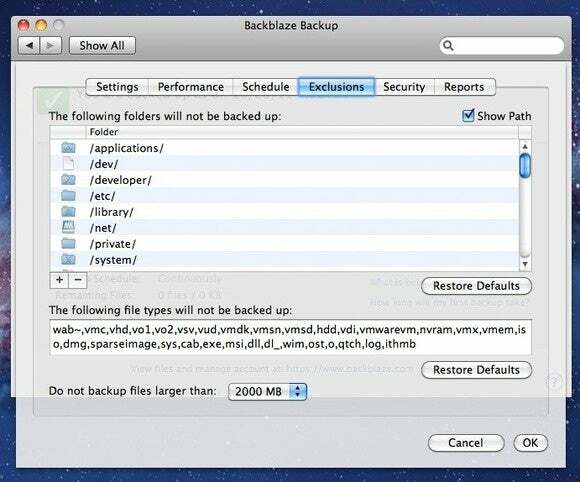 If you want local backups, too, you’ll have to use another app, such as Time Machine. Peer-to-peer backups aren’t supported at all. Carbonite. Carbonite is the only online backup service I’ve seen advertised on TV, and it seems to be both well-known and widely respected. Unfortunately, although Carbonite is pretty good on Windows, the Mac version lacks a number of features I consider essential, including versioning (storing old versions of backed-up files after the original changes). Only Windows users with a Plus or Prime plan can back up external hard drives or create local backups. By default, Carbonite backs up any new or changed file only once per day, which is far too seldom in my opinion. 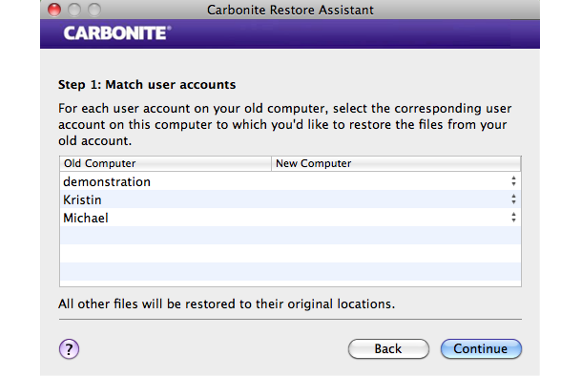 Carbonite can also help you move your user account to a new Mac. DollyDrive. DollyDrive started out as a cloud destination for Time Machine backups, but later morphed into a stand-alone cloud backup and sync service that doesn’t require Time Machine (a smart move). You can back up data on both internal and external drives, and the DollyDrive software can also clone your Mac’s disk to an external drive. The software is prettier and easier to use than CrashPlan’s, although less flexible. 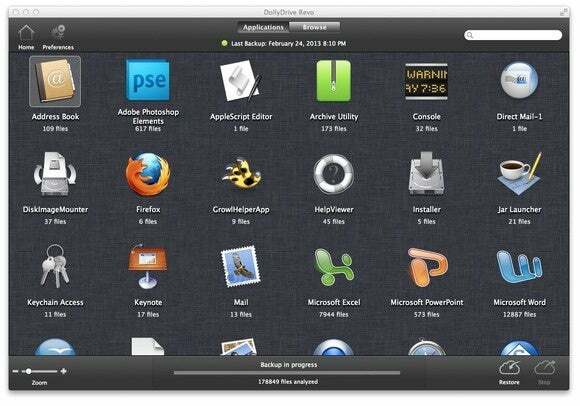 Dolly Drive can help you find files based on which application created them. But unlike the other services mentioned so far, DollyDrive doesn’t offer unlimited storage. Pricing tiers start at $10 per month for 250GB of data (discounted to $96 per year or $168 for two years) and go all the way up to 8TB for $198 per month. On the other hand, DollyDrive’s Family Plan, which lets up to 10 computers share the same account, is available at no extra charge. So depending on how much data your Macs need to back up, it could turn out to be less expensive than CrashPlan’s Family Plan. MozyHome. EMC’s MozyHome was one of the first modern mass-market online backup services, originally offering unlimited backup storage for $5 per month per computer (equal to Backblaze’s current pricing). But now the prices are higher and more complicated. You can store 50GB of data from one computer for $6 per month, $66 per year, or $126 for two years, or 125GB from one computer for $10 per month, $110 per year, or $210 for two years. Add extra computers for $2 each per month, and extra storage at $2 per 20GB per month. All that makes MozyHome’s cost per gigabyte significantly higher than the competing services. Mozy can help migrate data from an old Windows PC to a new Mac. Pricing aside, MozyHome has a nice set of features, including cloud sync of selected files. Alas, only the Windows version supports using a local hard drive as a backup destination. For me, the choice to use CrashPlan is partly a matter of its helpful features (notably local and peer-to-peer backups and flexibility in how files are restored) and partly a matter of economics—it gives me the most bang for the buck given my family’s backup needs. If you’re on the fence about CrashPlan (or any of the others), download a trial version, put it through its paces, and see for yourself if it meets your needs.